I came across this problem from a completed CodeForces contest. The problem is called "An easy problem about trees". Pieguy and Piegirl are playing a game. They have a rooted binary tree, that has a property that each node is either a leaf or has exactly two children. Each leaf has a number associated with it. On his/her turn a player can choose any two leafs that share their immediate parent, remove them, and associate either of their values with their parent, that now became a leaf (the player decides which of the two values to associate). The game ends when only one node (the one that was the root of the tree) is left. Pieguy goes first, and his goal is to maximize the value that will be associated with the root when the game ends. Piegirl wants to minimize that value. Assuming that both players are playing optimally, what number will be associated with the root when the game ends? The size of the tree is up to 250 nodes. No one in the contest solved this problem. What is an efficient algorithm to solve this problem? The problem can be simplified by choosing a threshold level T and answering the question "can piegirl guarantee to get a value less than or equal to T?". If we can solve this simpler problem, then we can use bisection to find the smallest value of T and this will be the answer to the original problem. The players take turns to combine blobs. You can combine two neighbouring blobs of the same size. The final colour will be your colour if either of the two blobs were your colour. I made a demo of this game here to try to get a feel for the strategy. There are often areas with a number of waiting moves that can be made that will not affect the final colour of the subpuzzle. I think a simple minimax lookahead (e.g. with an evaluation function that scores big blobs higher) may well work well in practice, but it feels like there should be an even better algorithm that solves this optimally. Any one have any further ideas? I've added a minimax solver to the demo (click FindBest to make the computer play a move). This works fine for depth up to 4, solving in milliseconds, but takes ages to think for depths 5 and above. I could accelerate this a bit by saving the results for previously seen positions, but even with this improvement it will still have an enormous state space to explore. This is not a complete answer, but it's too long for a comment. Let's call the players Blue and Red. For a given tree, there are four possibilities for who wins under optimal play: always Blue (B), always Red (R), always first player (1), always second player (2). We call a subtree Even if it has an odd number of leaves (i.e., an even number of moves) and Odd if it has an even number of leaves (i.e., an odd number of moves). Below is a case analysis missing a couple cases. It still may be useful for optimizing minimax search. The three qualitatively different possibilities for the subtrees are Even--Even, Even--Odd (symmetrically, Odd--Even), and Odd--Odd. Let's assume symmetrically that Blue plays first. Blue plays first and last. If there is a B or 1 subtree, then Blue wins by playing in it. Subsequent choices of subtree by Blue echo Red's plays. 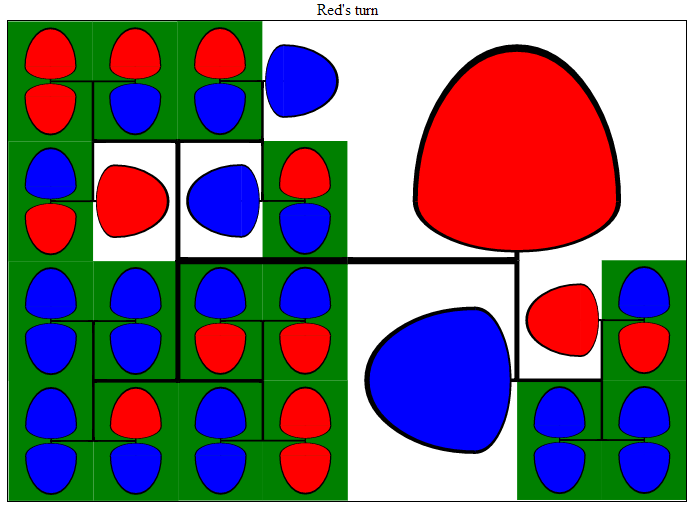 If both subtrees are R or 2, then Red wins by echoing Blue's choices of subtree. Blue plays first and last. If there is a B or 2 subtree, then Blue wins by playing in the other and stalling there whenever Red does. If both subtrees are R, then Red wins by forcing alternation in both subtrees. Blue plays first, and Red plays last. If the odd subtree is R or 2, then Red wins by stalling in the even subtree whenever Blue does. If the even subtree is B or 2, and the odd subtree is B or 1, then Blue wins by playing in the odd subtree and responding to Red's subsequent plays in the same subtree. The problematic cases seem to be those where one player forces the other to move twice consecutively in a subtree. It would seem from the contest parameters that there is ample time to determine wins/losses after one arbitrary move, but the case analysis gets very long, longer than I have patience for right now. The solution for this problem is a dynamic programming on a tree with O(n) complexity. In this editorial “even tree” means a tree in which players will make an even number of turns, while “odd tree” is the tree in which players will make an odd number of turns. We will be solving a slightly modified problem: one in which all the numbers on the leaves are $0$s and $1$s. Once this problem is solved, the general problem can be solved by doing a binary search on the answer, and then marking all the leaves with higher or equal value as $1$s, and all other values as $0$s. If the tree is an odd tree, then the first player makes the last turn, and it is enough that at that moment only one of the two children of the root is 1. If the tree is an even tree, then the second player makes the last turn, so for the first player it is critical that by that time both children of the tree are 1 if he wants to win. One simple case is the case when the tree is an odd tree, and both its immediate subtrees are even trees (by an immediate subtree, or just “subtree‘ of a node, here we will mean a subtree rooted at one of the nodes' immediate children). In this case we can recursively solve each of the immediate subtrees, and if the first player wins any of them, he wins the entire tree. He does that by making his first turn into the tree that he can win, and then every time the second player makes a turn in that tree, responding with a corresponding optimal move, and every time the second player makes a turn in the other tree, making a random move there. If both immediate subtrees are odd trees, however, a similar logic will not work. If the second player sees that the first player can win one of the trees, and the first player already made a turn in that tree, the second player can force the first player to play in the other tree, in which the second player will make the last turn, after which the first player will be forced to make a turn in the first tree, effectively making himself do two consecutive turns there. So to win the game the first player needs to be able to win a tree even if the second player has an option to skip one turn. So we will need a second dimension to the dynamic programming solution that will indicate whether one of the players can skip one turn or not (we call the two states “canskip” if one can skip a turn and “noskip‘ if such an option does not exist). It can be easily shown, that we don’t need to store how many turns can be skipped, since if two turns can be skipped, and it benefits one player to skip a turn, another player will immediately use another skip, effectively making skips useless. Now we need to consider six cases (three possible parities of children multiplied by whether one can skip a turn or not). In all cases we assume that both children have at least two turns in them left. Cases when a child has no turns left (it is a leaf node), or when it has only one turn left (it is a node whose both children are leaves) are both corner cases and need to be handled separately. It is also important to note, that when one starts handling those corner cases, he will encounter an extra state, when the players have to skip a turn, even if it is not beneficial for whomever will be forced to do that. We call such state “forceskip”. In the case when both subtrees have more than one turn left, forceskip and canskip are the same, since players can always agree to play in such a way, that the skip, if available, is used, without changing the outcome. Below we only describe canskip and noskip cases, in terms of transitions from canskip and noskip states. One will need, however, to introduce forceskip state when he handles corner cases, which we do not describe in this editorial. The answer for forceskip will be the same as the answer for skip in general case, but different for corner cases. even-even-noskip: the easiest case, described above, it is enough if we win any of the subtrees with no skip. even-even-canskip: this case is similar to a case when there’s one odd subtree and one even subtree, and there’s no skip (the skip can be just considered as an extra turn attached to one of the trees), so the transition is similar to the one for odd-even-noskip case described below. We win iff we can win one tree with canskip, and he cannot win the other with noskip. odd-even-noskip: if we can win the odd tree without a skip, and he cannot win the even tree without a skip, then we make a turn into the odd tree, and bring it into the even-even-noskip case, where he loses both trees, so we win. The other, less trivial, condition under which we win is If we can win the even tree with canskip, and he can’t win the odd tree with canskip. A motivation for this case is that odd subtree with a skip is similar to an even subtree, so by making a turn into the even case, we bring our opponent to an odd-odd case, where he loses both threes with a skip, which means that no matter which tree he makes a turn into, we will be responding to that tree, and even if he uses another tree to make a skip, he will still lose the tree into which he made his first turn. Since we make the last move, we win. odd-even-skip: this is a simple case. We can consider the skip as an extra turn in the odd subtree, so as long as we can win even subtree with no skip, or odd subtree with a skip, we win. odd-odd-noskip: we need to win either of the subtrees with a skip to win. odd-odd-skip: to handle this case we can first consider immediately skipping: if he loses noskip case for the current subtree, then we win. Otherwise we win iff we can win one of trees with a skip, and he can’t win the other without a skip. The more detailed motivation for each of the cases is left as an exercise.